​Focus Questions: How can media and digital literacy support social justice in the classroom? How do educators work with images for instructional purposes and further discussions about social justice issues? How can teachers use images when sharing or communicating what is happening in the classroom and in the world? Can you use images found in digital spaces? Can you post those pictures on social media sites? How does copyright, privacy and permissions impact your use of images in your teaching practice? Wanna Work Together - video on Creative Commons site exploring how to share, reuse and remix digital media. 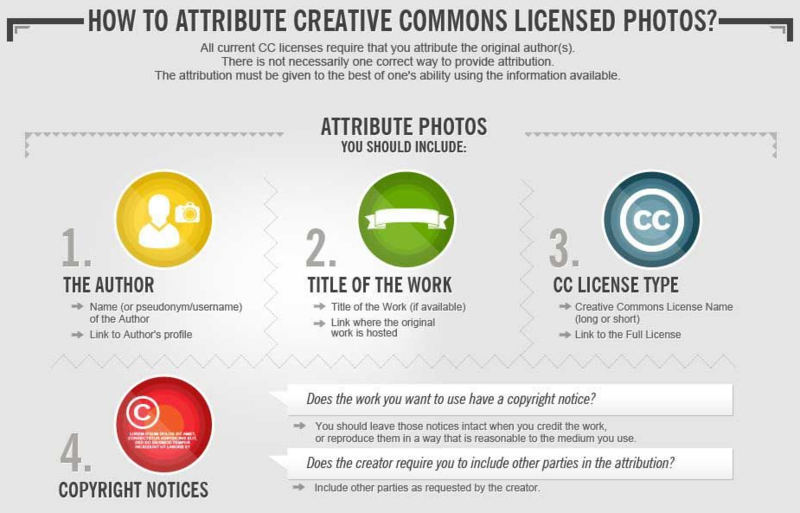 Choose a License - Creative Commons helper to produce and share your own creative commons license ​for images or authorship. Understanding copyright and licensing of images in digital publication is an essential first step. Examine the following links to develop your awareness of how and when to use images in your public and private digital spaces. You can use the Creative Commons CCSearch (in beta form) as an easy way to ensure attributions happen for images, where attribution is needed. Here's an image to show how this attribution generator works. Collections of images for educators can be found in a variety of digital locations. Here are a few to get you started. ACTIVITY: Begin gathering images with copyright considerations in mind. 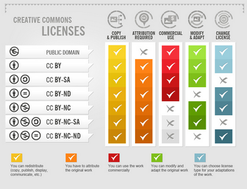 Review the Creative Commons Licensing options. Make a decision about which image licensing category to explore in Flickr Creative Commons or one of the other image collections listed above. Search for and collect up to FIVE images to curate, download, manipulate and/or create a 'derivative'. You can save downloaded images to an image collection folder for later use with your internship project and/or your blog site. Save attribution information for each of the images being collected using a word processing document or your image collection folder in our shared google drive file. Today we have the opportunity to engage in a global conversation about media and digital learning. We will share time and space through Virtually Connecting with the DMLConference (#2017DML) to talk to Henry Jenkins and Esra'a Al-Shafei. In preparation for this session, take a look at the DMLCentral blog post written by Henry Jenkins about How Young Activists Deploy Digital Tools for Social Change. Consider how this may impact your teaching practice as you begin your teaching journey. Consider the potential for global connections in projects that make a difference for your students. Investigate the use of Instagram in education. This article is a good research focused starting point - Embracing the selfie craze: Exploring the possible use of Instagram as a language mLearning tool. How can teachers using this digital tool in the classroom? What are the risks and rewards? Do you personally use Instagram - if so, what critical digital insights can you share with classmates? Read this blog post as one teacher explains how she set up and uses a class Instagram account. Why teachers and principals should be on Twitter, Facebook and Instagram, CBC, Sept 2015. Take time to learn about Snapchat in the classroom. Start with some basic information about Snapchat. Then search for resources and teacher's experiences using this digital resource in the classroom. Consideration for the use of student images in digital media productions is necessary for all educators. Check on the school and school board policies and permissions before using student images on the internet. Awareness of school district's codes and policies about copyright and fair use is required for anyone working with students in schools. Search for a school district and find information that you will need to know, as a future teacher, about copyright and online codes of conduct. Canadian educators in Alberta share insights and experiences, through a series of videos, for one classroom example of investigating pictures. The 'modelling the tools' outlines the plan and document resources. These are available from The Critical Thinking Consortium website, Teaching resources section. Do you have the right answers? Where will you find answers to your student's questions? What affinity space can you join to collaborate with others to engage your own and your student's learning? What do you need to do more of to prepare yourself for a media and digitally literate teaching practice?